Richard F. Gordon Jr. walked in space on Gemini 11 and orbited the moon on Apollo 12. He was born Oct. 5, 1929, in Seattle, Washington. He received a Bachelor of Science degree from the University of Washington in 1951. Gordon, a retired Navy captain, received his wings as a naval aviator in 1953. He attended All- Weather Flight School and jet transitional training and was assigned to an all-weather fighter squadron at the Naval Air Station, Jacksonville, Florida. He attended the Navy’s Test Pilot School at Patuxent River, Md., and was a flight test pilot there until 1960. He later served with Fighter Squadron 121 at the Miramar, California Naval Air Station as a flight instructor in the F4H and participated in the introduction of that aircraft to the Atlantic and Pacific fleets. He also was flight safety officer, assistant operations officer and ground training officer for Fighter Squadron 96 at Miramar. He won the Bendix Trophy Race from Los Angeles to New York in May 1961, setting a new speed record of 869.74 miles per hour and a transcontinental record of 2 hours 47 minutes. 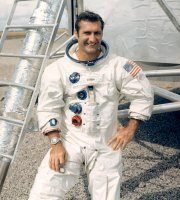 Gordon was selected as an astronaut by NASA in 1963. He made his first space flight as pilot on the three-day Gemini 11 mission, launched Sept. 12, 1966. He and commander Charles Conrad Jr. tracked down and docked with an Agena satellite. Gordon left the spacecraft for a planned 115-minute space walk, but he had to cut it short after 44 minutes because of difficulty maintaining his position in weightlessness without handholds or foot restraints, a valuable lesson for later space walkers. They used the Agena engine to rocket to a then-record altitude of 850 miles. Gordon and Conrad were back in space together on Nov. 14, 1969, on the Apollo 12 moon mission. With them was Alan Bean. While Gordon circled 60 miles above the moon, Conrad and Bean demonstrated a pinpoint landing by parking the Lunar Module in the Ocean of Storms near an unmanned Surveyor craft that had touched down there two years earlier. They conducted two outside excursions to gather rocks and other information. In 1971, Gordon became chief of advanced programs for the Astronaut Office and worked on the design and testing of the Space Shuttle and development equipment. A year later he retired from NASA and the Navy to become executive vice president of the New Orleans Saints professional football team. He retired in 1997 as president of Space Age, America Inc. of Los Angeles, and he and his wife, Linda, live in Sedona, Ariz. Gordon serves on the Board of Directors of the Astronaut Scholarship Foundation. Richard Gordon was inducted into the U.S. Astronaut Hall of Fame on March 19, 1993.